The Subsea Company launches 16 innovative BOP Drift Variations in accordance with API 16A, Third Edition that will reduce risk. June 19, 2014 (Houston, TX) – The Subsea Company has been busy innovating tomorrow’s standards with a recent launch of 16 standard drifts, designed in accordance with API 16A, Third Edition. Many companies are using these drifts to satisfy API 53 requirements as a worst-case safe guard in order to meet compliance and improve overall performance. The Subsea Company, a leading manufacturer of subsea equipment solutions, engineered the new BOP Drift configurations to allow for quick and safe drifting of BOPs. Designed, tested and certified to withstand years of service in an offshore environment, these innovative configurations improve the overall safety for Drifting Blow Out Preventers. The Subsea Company’s BOP Drifts help reduce potential downtime issues, thus saving oil & gas companies, OEMs and drilling contractors time & money. 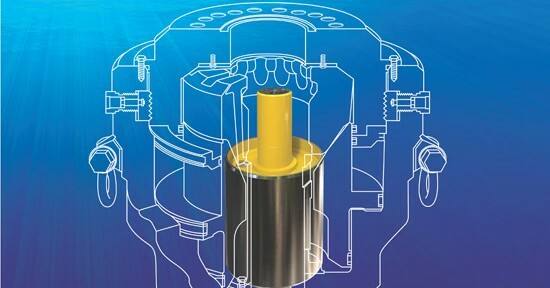 The Subsea Company’s Drift designs are manufactured with several different connection options and are engineered with “True Precision” balance to ensure optimal and reliable performance. Each drift is built around a perfectly concentric mandrel and has the ability to transfer mass load to the solid straight bar center shafts and lifting eyes. The pad-eye versions are pull tested at 4,500 lbs. while the drill pipe versions are tested at 15,000 lbs. Drift total weights vary from 320 lbs. to 1,285 lbs. depending on connection option and mandrel length. The precisely machined components are assembled and welded to create a rugged one-piece drift, built to stand up to the harsh conditions in an offshore environment. Readily available, The Subsea Company has proven the willingness and ability to customize drifts per customer specification. The new product line of BOP Drifts is available for purchase with and without shipping containers for easy transport. Typical reasons a BOP will not drift include: BOP is repaired or built out of spec, the rams do not fully open after closing and the annular does not open after testing. Failure can result in millions of dollars in losses. For the last decade, The Subsea Company team has gone to great depths to develop new standards and long-term solutions to help prevent a crisis in subsea territory. In addition to BOP Drifts, The Subsea Company is launching an extended line of specially formulated lubricants and certified pressure gauges, vacuum test equipment and a BOP Fluid Conditioning and Filtration system to complement its custom Riser & MUX clamping solutions. The Subsea Company welcomes customer visits to the manufacturing plant located in Houston, Texas, where they can demonstrate the ingenuity of their product designs, rigorous testing and the ongoing compliance procedures.